Two Democratic Senators from Montana have spoken out about allowing Guantanamo Bay detainees into a state jail. A new jail constructed in Hardin, Montana was to be the new home for the prisoners. Local Hardin officials have insisted that they do want to house the detainees in order to help pay the cost of the jail as well as create jobs in a troubled economy. I hope better transportation will be provided when they move. Greg Smith, the Two Rivers Authority director, said “Somebody has to stand up and put (the Guantanamo prisoners) in their backyards. It’s our patriotic duty.” Despite this local opinion, Senators Jon Tester and Max Baucus apparently believe that housing the criminals in their state will hurt them politically in Montana’s other districts. Rehberg is a pretty typical lobbyist dicksucker, so I’m not too surprised about him. But Tester and Baucus need to realize that their state is perfect for housing these detainees. Hardin is a town of less than 4,000 people and there are no large cities that detainees could escape to if they were somehow freed. Not to mention the fact that every single damn person in Montana owns a gun and will not hesitate to fire at trespassers. One of my friends learned that the hard way. We need to follow the rule of law. 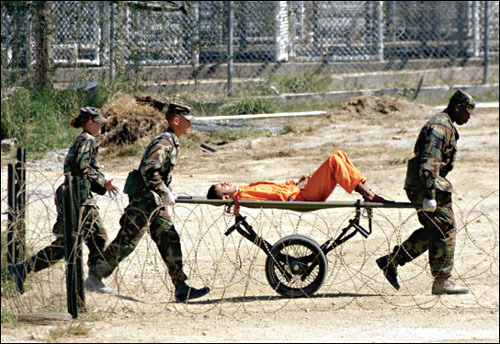 Hell, Baucus voted for giving Gitmo detainees Habeas Corpus, so he shares my sentiment. I just feel like this is all being done for political expediency. It may not be popular in Missoula and Billings, but if Hardin residents want to work and are willing to provide top-notch security, then some federal bureaucrats, who probably shouldn’t even have a say in this (what does Governor Brian Schweitzer think?) should just let it happen.